With 10 vibrant nontoxic colors, the Crayola Washable Kids' Paint Set is a versatile multipurpose kit for your child's art projects. The paints are ideal for color mixing and will dry to a smooth finish without cracking or flaking. Kids will enjoy the paint set's versatility, smooth flow, and lively hues, while you'll appreciate the easy cleanup. Bright paints dry to a smooth finish. This washable paint set includes 10 bright, rich colors for painting posters, banners, arts and crafts projects, and more. The paints offer excellent color mixing, so kids can explore and create new shades. Enjoy smooth, easy flow onto painting surfaces and a vibrant matte finish that won't crack or flake. With excellent color properties and performance, this paint set is ideal for experimenting with basic painting techniques. Kids can practice creating both hard- and soft-edge strokes and explore over-painting, color mixing, line strokes, and stamping techniques. The nontoxic paints are easily washed off skin, fabrics, and other surfaces, making cleanup a breeze. Crayola Washable Kids' Paints are not for use as face or body paint. 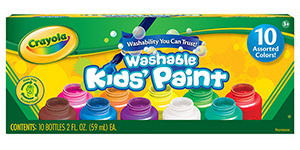 10-count Washable Kids' Paint set and two-ounce bottles.